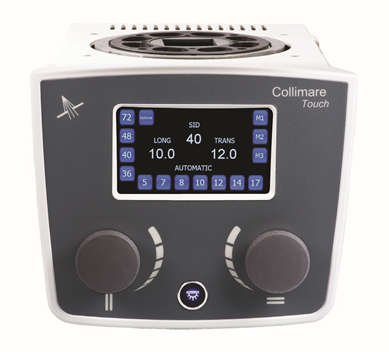 For more than 30 years the founders of Collimare® have been designing state of the art, yet “simple” collimator designs used throughout the world by leading diagnostic imaging manufacturers. Collimare® has spent the last 8 years applying over 30 years of design experience and innovation to create a new low cost, light weight, high performance line of collimators. A simple yet rugged design with features that allows it to encompass all of your manual collimator needs from non-certified veterinarian units, portables, mobiles, to high throughput clinical applications. Direct coupled turn knobs, flat blade shutters, large passive lamp cooling heatsink, thermal cutout safety switch, lamp soft start, optical grade acrylic output window, two Class I Lasers for crosshair alignment, quick full cover removal, external light field adjustments, to name just a few of the advanced design features. Industry first with the inclusion of 2 Class I Lasers for crosshair alignment as a standard feature on all the Collimare® product line.